It’s spring and a journey in the countryside is a must in Cyprus. If you’d care to accompany me, I will take you on a journey to the Troodos mountains, and we’ll follow an adverse route which passes through the Marathasa valley. We take the main road from Nicosia to Troodos, passing the Astromeritis village – a village known for its watermelons and also for being a common a resting point for travellers to the mountains in days gone by. From here, we turn right, following the snakelike road leading us to the valley. The route through the pine forest takes us past gorgeous scenery, where we enjoy the fragrance and beauty of the wild garden of nature with its flowers and the blossoming of the spicy bushes of the forest. We drive on, and at last enter the valley of Marathasa, as it’s called in the folklore language. The classical Greek name for this valley is Myrianthousa – both names mean ‘colourful’. 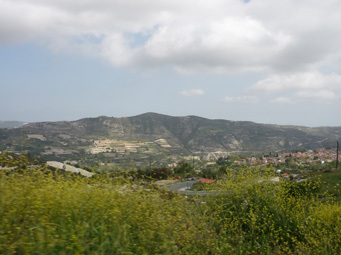 This is the valley referred to as the most beautiful region in Cyprus by the Russian monk Basil Varsky when he visited the island from 1726-1735. Varsky recorded the area in his chronicles, with its forests, steep mountains, churches, monasteries, springs, streams, healthy climate and hospital inhabitants – here to benefit from the invigorating climate and waters. More than two centuries later, those things haven’t changed, and as we enter the valley we feel as though we’re entering a small Garden of Eden. Here, we take a break at the first traditional coffee shop we find. Under the shade of a vine we enjoy our local coffee and our walnut sweet, a sweetened preserve that’s a favourite of all Cypriots. Leaving the coffee shop and proceeding further into the valley we’re astounded by the scenery which now appears before our eyes: steep mountains covered by the rich and varied vegetation that nature offers us. There are fruit trees such as apple, pear, cherry, apricot, peach, and fig, there are olive trees and small, narrow vineyard groves. As we drive further, the beauty of the scenery is completed by the appearance of Oikos – a tiny village – on our left on the opposite side of the valley, as well as a small dam on our right which blends in perfectly with the environment. High up in the mountain are the first stone-built houses of Kalopanayiotis, which still retain their traditional architecture in appearance and structure. This is the village we used as a summer holiday resort during our childhood. On entering the village, scenes of the past appear in front of us, as in a dream. The houses have vine-covered sheds and small earthen furnaces used as ovens by the housewives to cook a variety of local dishes. These include tavas (meat with onion), kleftiko (slow-cooked lamb), potatoes, bread and many other recipes. The tin flower pots also catch our eye, as well as the traditional chairs (called locally ‘tsaeres’), and the piles of wood used for the furnace and the fireplace indoors. We can still see the narrow stone built roads of days gone by, and if we close our eyes we can hear the steps of the traditionally dressed old villagers. We can hear the hoof falls of the loaded donkeys and the noise made by the goats, all returning home after completing their agricultural work in the tiny groves the villagers own in different plots scattered on the mountains. Nearly all the houses have covered balconies and a yard with a vine that offers not only its fruit but also its refreshing shade. In the yard we also see various other fruit trees, flowers, decorative plants and vegetables. We rented one of these houses during our childhood visits. Back then there wasn't any electricity or water supply and we had to use petrol lamps and fetch water from the spring or the public fountains scattered in different places of the village. This wasn't easy as it was a daily task to fill up the heavy water barrels in the house we rented, before we could go out and wander through the village. We used to visit the abandoned St John the Lambadisti monastery, which we now see renovated, and the Panayia Theoskepasti a small church hidden under a huge oak tree. The church yard of the monastery and the stream nearby were our playground. Standing now on the bridge over the stream, we can see the sulfuric springs where women used to wash their clothes, and where donkeys were loaded with buckets of sulfuric water, which was used to cure patients suffering from rheumatism. This was the main purpose of having our childhood summer holidays in this village as our father was a rheumatic patient. For years the sulfuric water would be brought to our rented house by donkey, and our father would take hot baths in it – which eventually cured him of his rheumatic pains. But he was not the only one to benefit from this summer environment. The clean atmosphere, the fresh mountain breeze from the Troodos mountain, the healthy, organic food, fruit and vegetables, the long walks along the banks of the river and the rough mountain footpaths – these helped all the members of my family to regain our energy, confidence and health.These are things that come to mind as we pass through the village where I spent part of my youth. Driving on now, we reach the coffee shop on the outskirts of Kalopanayiotis. This coffee shop belongs to an old lady who prepares all the local delicatessens and sweets in a shed.You can find anything from ‘soutzoukos’ (long soft sausage-like sweets made of grape juice), ‘palouzes’ (grape juice cream), ‘kiofteria’ (grape juice pies), ‘sisamopites’ (pies made with sesame seeds), ‘glyko tou koutalio’ (sweet fruit preserves with their sweet syrup kept in jars), local nougats and many other local productions you can’t find easily in the rest of Cyprus. As we continue on the road out of Kalopanayiotis, we very shortly see another small traditional village called Moutoullas, known for its spring waters, followed by the larger village of Pedoulas. Both Moutoullas and Pedoulas have a very special role in the Marathasa Valley, which we’ll explore on our next trip together.